Q: What’s your idea of a perfect piece of web content? Something short and snappy that makes me want to delve deeper into the product, service or subject matter. Q: What is your current content focus? Personal branding and digital PR. It’s the crucial niche my business, Delightful Communications, is built around. Q: What is your biggest marketing fear? Not keeping up with the rapid pace of change. It gets harder to stay informed if you’re not disciplined. Q: What do you dislike most about your website’s appearance? Nothing. I think Kean Richmond at Bronco.co.uk did an awesome job in programming my vision. Q: What buzzwords are you guilty of using most? I used to work at Microsoft, so there are too many to mention. If I were a type of content, I would be… a 700 word blog post. Timely, informative, not too wordy and something you might like to like. Q: What brands do you have a marketing crush on? Moo.com and Warby Parker. Such great on and offline outreach and customer service. Q: Which results make you happiest? Making people smile and numbers that can be sliced and diced to tell different positive stories depending on the audience. Q: What marketing skill would you most like to have? I did want to be an Excel whiz like John Gagnon from Bing Ads, but I recognize my strengths and limitations and am over that. Just. 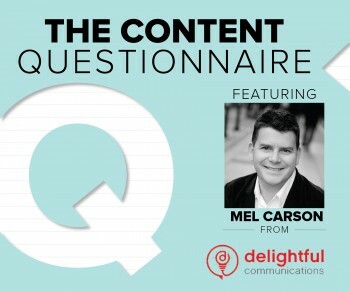 Q: What do you consider your greatest content marketing achievement (to date)? The videos I helped produce for Microsoft Advertising at Cannes and AdWeek when I worked there. Here’s a highlights reel the media company, Cherry, made for me when I left. Q: If you were a type of web content, what do you think it would be? A 700 word blog post. Timely, informative, not too wordy and something you might like to like. Q: What personal trait are you always trying to improve? I’m a maladaptive perfectionist which means I procrastinate a lot. Or do I? Q: Do you think your office environment reflects your brand? Yes. I have a standing desk which keeps me agile and on my toes. Q: What is your brand’s most valuable asset? The name Delightful makes people feel good and what I do makes them lean in. Being very specific about what Delightful doesn’t do has been as important as articulating what it’s about as well. Q: What is your favorite part of the workday? The morning when I’m fresh, energetic and chomping at the bit to produce great work. It’s also when my young daughters wake me up, so that’s a bonus! Q: What is the quality you like best in other brands? Having good ears and existing authentically. Q: What’s the quality you like least in other brands? Not practicing what they preach and churning out marketing ploys you can see through. Q: How can other brands/marketers get on your good side? Surprise me in a good way. Q: Who are your favorite writers/brand leaders (online or off)? I have respect for Tamar Weinberg, my Pioneers of Digital co-author, Paul Springer and David Sable. Oh and Alan Weiss was very, very useful in starting my business. Be agile. Be delightful. Be unexpected. Q: What is your marketing pet peeve? Where companies still operate marketing and teams PR in silos and they miss a massive trick by not having an integrated approach to their outreach. Q: What’s one social media trend that you wish would die out? Infographics. Never liked them. I’d rather watch a 30 second video. Q: What’s your current inspiration? My daughters Maggie and Elizabeth. I try and build a better world for them through what I do for my clients. Q: What is your marketing motto?